Connect Mental Health is a community mental health organisation run entirely by a core group of volunteers with the support of the HSE, DLDC and Mental Health Ireland. Our aim is to raise awareness of mental health issues in Donegal through educational seminars, digital media, workshops and events. 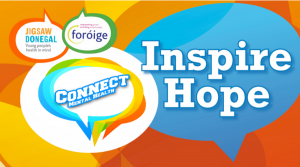 Here you will find information on our upcoming events and workshops, how to find and access local supports in Donegal, inspirational talks and information on your own mental health and how you can support others. Connect Mental Health was founded in January 2015 to help raise awareness of mental health issues in Donegal. Our annual programme of events and activities are 60% funded through fundraising events and 40% through the support of the HSE, DLDC and the ESB. ‘Inspire Hope’ Youth Conference brought 250 students together on Friday 22nd September for an educational and interactive day. 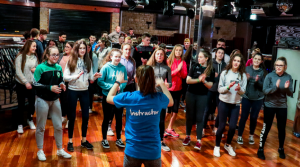 The event, held in the Abbey Hotel Donegal Town, was run in partnership with Foróige National Youth Organisation and Jigsaw Donegal. We partnered with Donegal Mind Wellness to bring their 6 week Stress Control Programme to Ballyshannon in February 2017 and to Donegal Town in November 2017. A partnership with Mental Health First Aid Ireland and the HSE resulted in us bringing 5 Mental Health First Aid courses to Donegal in 2017. These took place right across the county with courses being run in Ballyshannon, Portnoo, Moville, St Johnston & Dunfanaghy. A week long programme of school workshops, film screening, youth conference, business workshop, community conference and educational workshops. On January 21st 2016 we partnered with Suicide or Survive to bring their 1x full day Wellness Workshop to Cashelard, Ballyshannon. This workshop was attended by 38 people and was delivered free of charge to attendees. We partnered with Aware to bring their renowned 6 week Life Skills Programme to Ballyshannon in November 2016. The Programme began on 8th November and was attended by 26 people for the duration of the programme. This programme was delivered free of charge to attendees. We have also been participated in school workshops, business wellness weeks and other community events.